One of the best ways of delivering a message is with the use of humour. 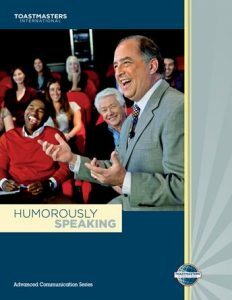 Learn how to begin a speech with a humorous story that get’s the listeners’ attention, end a speech with a humorous story, use humorous stories and anecdotes throughout the body of your speech to emphasise points, incorporate fun into presentations and prepare and present an entirely humorous speech. This is not about just throwing in lots of jokes; there’s a tremendous difference between a well crafted humorous speech and a collection of jokes. Objectives:• Prepare a speech that opens with a humorous story.• Personalise the story.• Deliver the story smoothly and effectively. Objectives:• Prepare a serious speech that opens and closes with humorous stories.• Prepare a closing story that reemphasises the speech’s main point.• Deliver the stories smoothly and effectively. Objectives:• Prepare a speech that opens and closes with humorous stories.• Include jokes in the speech body to illustrate points or maintain audience interest.• Deliver the jokes and stories smoothly and effectively. Objectives:• Prepare a speech that opens with a self-depreciating joke.• String together two or three related jokes in the speech body.• Close the speech with a humorous story. Objectives:• Use exaggeration to tell a humorous story.• Entertain the audience.• Effectively use body language and voice to enhance the story.